Playing without Joel Embiid tonight, Ben Simmons had 19 points, 12 rebounds and 10 assists. It was the fourth triple-double of his NBA career. Tonight was supposed to be another milestone for Simmons: the debut of his jump shot. Coming into tonight’s game against the Bulls, Simmons had pretty much avoided shooting anything outside of the paint. But Brett Brown said before tonight’s game against Chicago, the team “might” encourage Simmons to start firing away. So, how many of his 19 points tonight were on jumpers? Simmons did fire an 80-foot shot at the buzzer, though it missed. 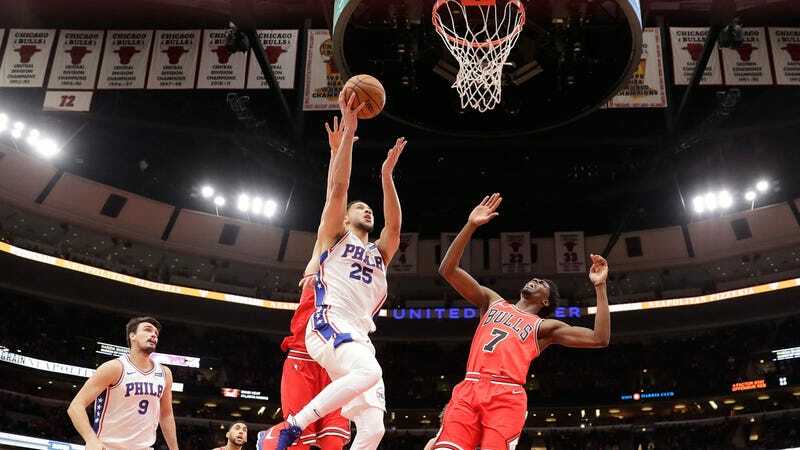 Worst of all, the Bulls beat the Sixers, 117-115. It was Chicago’s sixth win in a row; Philly is 3-8 since an 11-7 start. Who knows, one day, Ben Simmons may begin shooting jumpers. But it wasn’t tonight.